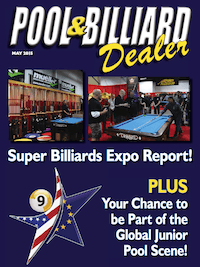 The “Pool & Billiard Dealer” monthly online magazine, featuring several items of interest to billiard business members, is available FREE to all Billiard Businesses. If you are a Manufacturer, Distributor, Retailer, Pro Shop, Pool and Billiard Room, or Billiard Service business, send us your Business Name, Contact Person, Address, Email, and Telephone to start receiving your FREE Pool & Billiard Dealer prior to the 15th every month. Email to: Shari@poolmag.com. ← HOT TIP: Want to Win More Pool Games?